The Ooma home water sensor has a small probe end with two exposed conductors to sense water. When viewed from the side the probes have a slight angle to one side, so you should be careful if you place this flat on the floor. If you put it upside down you'll need a much deeper puddle to trigger the alarm. But to help with this Ooma included a pass through to fasten the probe. By popping off the rubber circle with the Ooma logo, you can use a small screw through the probe to hold it in place. If you insert the screw from the logo side you will be sure the probes are as close to the surface as possible. The sensor has about 3 feet of wire which should be sufficient to mount the sensor in remote locations but keep the battery housing close. Since the battery housing appears to be the same as the door/window switch I won't say much other than to repeat it is kind of big. The Ooma home siren is smaller than most others I am used to but this one is AC powered vs the other battery powered ones I have connected to another hub. 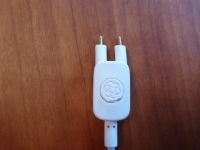 The device is white in keeping with the other devices and has an Ooma logo on the front along with a slot where the emitter is. 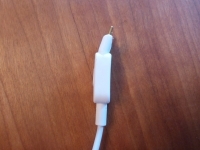 Around the back there is a standard two prong plug and along the bottom is a pairing button. In some ways I like the idea of no batteries to change, but on the other I do want to have an audible alarm if the power is cut. This could be plugged into a UPS but that may limit your suitable mounting locations. 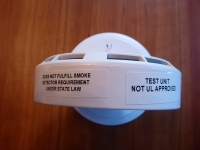 The first thing that struck me with the Ooma home smoke detector was the sticker indicating it "Does not fulfill smoke detector requirement under state law." Thankfully this is just because my unit was a pre-production unit so it didn't have all the certifications yet. Rest assured, the units that they will be delivering are fully compliant with state requirements. 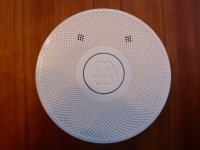 Otherwise this unit is fairly typical for a smoke detector, it is white and round with a removable back plate that you mount to your ceiling. I do wish the stickers were placed on the shipping bag rather than the smoke detector as they were a bit hard to remove. 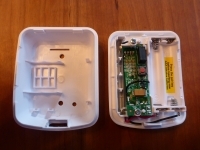 As with most new non-hardwired detectors these come with 10 year batteries pre-installed. So no more periodic 9V battery replacements. Since this is a photoelectric sensor it should be a little slower than an ionization sensor for fast moving flames but significantly faster than ionization for smoldering fires. 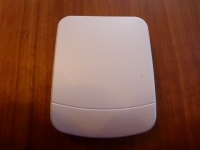 Finally we get to the vetch garage door sensor which is the only item included that is not marketed by Ooma. I presume this was to show the interoperability of the ULE standard from other manufacturers. 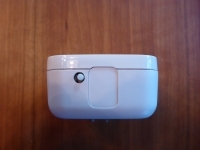 This device is very similar to other tilt sensors I have used though it might be slightly larger than some options measuring 2 1/4" x 2 7/8" x 7/8". 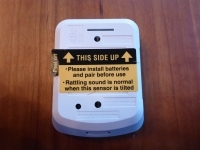 This unit also uses standard AAA batteries which can be easily exchanged when you pop the cover off. They also include a sticker to let people know the rattling sound is normal for this type of switch and to indicate which way you need to mount it. Overall this is a very simple straightforward device. Overall Ooma home has a decent offering of sensors that would cover many people's needs but many other systems offer things like keypads, glass break sensors, video doorbells, panic buttons and carbon monoxide sensors. Hopefully there will be more devices coming in the future, but for now let's focus on the getting these sensors up and running.